Crazy Shenanigans: Yay! I finished! Remember the blanket I've been working on? Well after finishing the infamous quilt, I turned all of my attention onto the blanket. I can now say it's done! 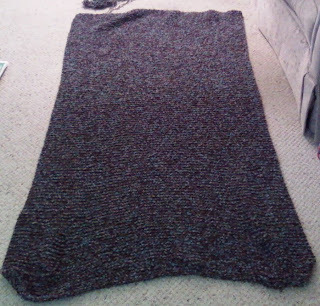 It's a twin sized, knitted blanket. Pardon the horrible quality picture. It was taken with my camera phone. In case you can't tell it's aqua blue and brown. the blanket turned out awesome! And those pictures are adorable! The blanket looks good, waaaaay better than I'd ever make that's for sure. I need some inspiration to be more suzy homemakerish-- got any tips? hahaha..I had an obsession with raccoons as a child so dont feel alone :) The blanket looks great, I wish I could knit or sew or anything really :). I LOVE the pictures, how funny! Congrats on completing your project. I always manage to start them, just never finish! That is quite a feat! Great job! Wow! Love the blanket! I'm working on crocheting and it's taking a LONG time! Impressive!! It looks so cozy! Such cute pics of you with the squirrel! I love that blanket! I totally am in love with the colors you chose! Wow great job on the blanket! That looks great! very cool - i wish i could be this crafty! Bravo..it turned out so well. And cute pics of you as a tiny tot. Lovely blanket and I LOVE those pictures!!! Such a cutie! Wow I can't believe you made that! That is so cool! I wish I could learn to do that! And those pics of you are too cute! congrats on finishing the blanket! it looks great. and those pics are adorable!!! 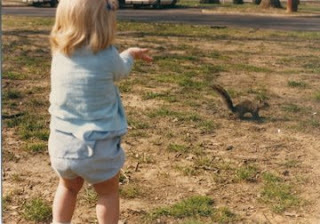 I love squirrels too. I feed them at our house.